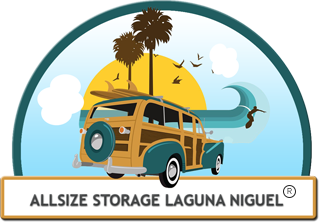 Allsize Storage is located near San Clemente in Laguna Niguel. We offer the best, most secure and convenient self-storage units and services for all your storage needs. With over 30 years of experience San Clemente Storage is reliable and has consistently provided high quality services to all of their valued customers. The team of professionals at Allsize San Clemente Storage will help you make your moving process simple, effective and easy. This secure, safe, and locally owned facility offers storage units ranging from 4×5 to 20×25 for your personal and business needs. For example, household or commercial units, military or student storage and more. The storage facilities are fully fenced and conveniently located near secure residential and business locations. Allsize San Clemente storage units are clean, well lit, and highly secure with state of the art 24 hour surveillance and electronic gate system. The experienced and friendly staff knows that keeping your valuables safe, secure and creating a lasting personal, honest and respectful experience is essential to providing an excellent storage solution for everyone. Therefore, the San Clemente Storage facility and staff provides exceptional services, such as state of the art 24 hour video surveillance that records all activities on our property and secured keypad entry to electronic gated access exclusively for San Clemente storage members. In addition, Allsize San Clemente Storage has complimentary use of dollies and flatbed carts in order to help make their valued members moving transition less stressful. Furthermore, all San Clemente Storage units have wide driveways and can be reached with any vehicle making it very accessible to move your belongings. In order to make your transition into the perfect storage units as smooth as possible, moving supplies such as boxes of all sizes, bubble wrap, locks and cell packing kits are also available at afford prices. Business document shredding available, and business deliveries are also accepted and delivered right to your storage. Storage units ranging from 4×5 to 20×25 for your personal and business needs. Allsize San Clemente Storage offers competitive month to month prices and our team of professionals will help you get the best deals for the perfect storage units that fit your needs. There are storage units with 11’ ceilings perfect for anyone ranging from personal use to business storage, boats, vehicles, motorcycles, etc. San Clemente Storage always offers military and senior discounts. Prices starting from as low as $100, special offers and extended discounts are available.